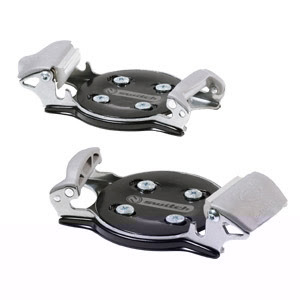 Snowboard bindings have a simple job: Attack the snowboarder’s feet to the board. The most common binding technology today is the strap binding. 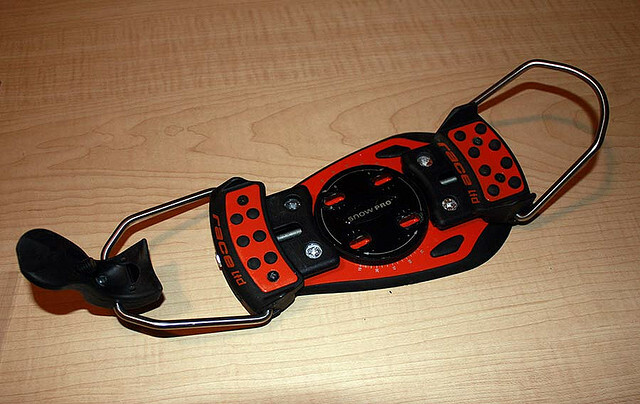 Here’s a 2006/07 Ride SPi binding, to give you a basic idea of what a strap binding looks like. The large red portion is called the highback. You make sure it is in the upright position, and then use two hard plastic straps to secure the board to your feet. One strap goes over your ankle, the other goes over your toes. (Sometimes the toe strap goes in front of your toes instead of over them.) You thread each strap, which has multiple ratchets, through a buckle until you reach your desired tightness. Some people like their bindings to be tight; some prefer them to be very tight. Strap bindings have not always ruled. As late as 2004 or so you might have received step-in bindings when you went to the rental shop. Sometimes known by the brand name of Clickers, step-ins promised ease of use. For people who had tried downhill skiing sometime since the 1970s, step-ins offered a vague sense of familiarity. Clicker bindings have all but disappeared from the earth. For a variety of reasons, however, step-in bindings fell out of favor. There is one exception though: A version of these bindings is used by riders who enjoy “carving” or “alpine” boards.